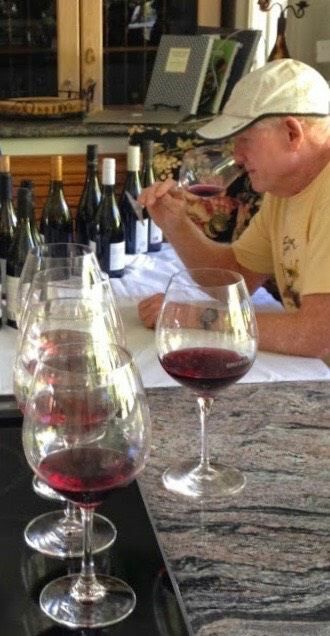 The art of describing tasting experiences with exalted domestic Pinot Noir is a real challenge. Lisa Perrotti- Brown said, “It is incredibly difficult, arduous and time-consuming to rack up the level of experience necessary to review and score wines with consistency.” Not only that, even well-trained wine critics are not paid much for what they do. All that said, it is the non-monetary and inspirational benefits that are most valuable to those fortunate enough to experience the current crop of domestic Pinot Noir wines. Besides, someone has to be an arbitrator of taste. 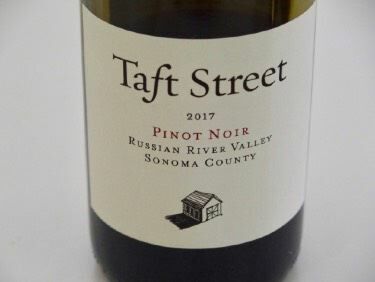 Many of the California wines reviewed here are infused with a level of meaning that no other beverage can offer and several of these Pinots stole my heart. Hopefully, readers will experience some of these wines and try to understand and even describe how Pinot Noir creates magic in a glass. Sonoma Coast Pinot Noir and Chardonnay crafted by proprietor and 5th generation winemaker Kurt Beitler since 2004. Kurt leases three Pinot Noir vineyards located in the vicinity of the town of Occidental and are among the nearest vineyards to the Pacific Ocean in all of North America. Check out www.bohemewines.com. 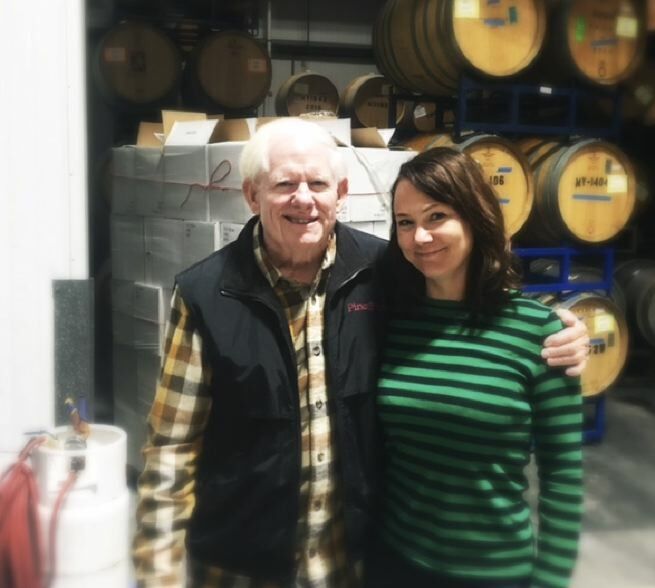 This winery began in 2006 in San Francisco’s Crushpad, shifting to an urban winery in San Francisco, and with the purchase of Graton Ridge Cellars of Sebastopol in 2016, operations moved to that location. Production is now 5,000 cases. I first encountered the winery’s 2008 vintage wines at Pinot Days and have followed their success since that time. Proprietors Chad Richards and Bob Zeches employ Erica Stancliff as head winemaker. Check out the winery at www.furthermorewines.com and www.princeofpinot.com/winery/ 1018/. The following wines will be released in April 2019. A top-shelf winery founded by Daniel Morgan Lee in 1982 with the first Pinot Noir release in 1988. 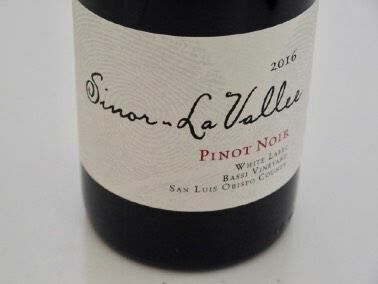 This producer of Pinot Noir and Chardonnay from the Santa Lucia Highlands has been named “Winery of the Year’ by both Wine & Spirits magazine and the San Francisco Chronicle. The wines are always dependable and frequently outstanding. 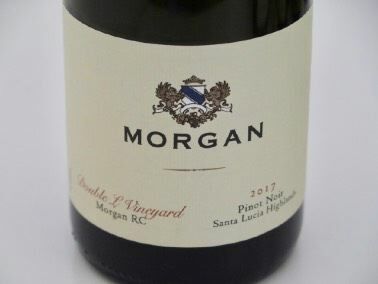 For more information, visit www.morganwinery.com and www.princeofpinot.com/ article/1993/. A few issues back, I portrayed Dr Kirk Neely and his Pinot Noir and Chardonnay wines from the Spring Ridge Vineyard. The two additional releases from the 2016 vintage are terrific and reviewed here. These wines and the Chardonnays reviewed elsewhere in this issue are part of the 2019 spring release. 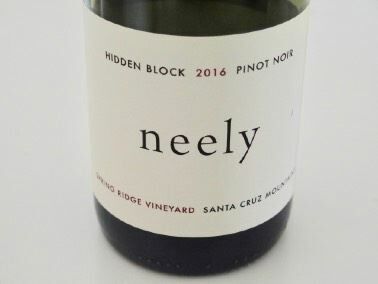 The previously reviewed 2015 vintage wines were transitional in that the grapes left the vineyard and were crushed in San Francisco under the direction of Shalini Sekhar, Neely Wine’s second-generation winemaker. In 2016, the grapes never left the vineyard until delivered to a warehouse in bottle. The 2016 vintage is a homecoming and the beginning of a revised finesse and understanding. The Pinot Noirs, in particular, are a step up. The wines will be released March 25, 2019. 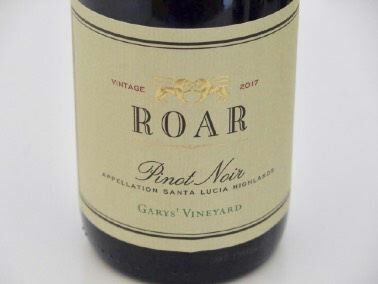 ROAR Wines is owned by Gary and Rosella Franscioni, who also own the nearby Garys’ Vineyard, Soberanes Vineyard in partnership with the Pisoni family, and are the sole owners of Rosella’s Vineyard and Sierra Mar Vineyard. Pictured below are the two famous Garys, Gary Pisoni (left) and Gary Franscioni. Winemakers Gary Franscioni and his son Adam are now crafting wines from the Santa Lucia Highlands that are among the elite of this appellation. I missed the 2016 vintage wines, but these 2017 vintage releases are full of personality. The grapes for the Pinot Noir wines are picked on the ripe side resulting in higher ABVs and aged in significant new oak, but the resulting flamboyantly-fruited wines are beautifully balanced and although young, are easily approachable now. In 2015, Roger Roessler Wines celebrated fifteen years of winemaking. 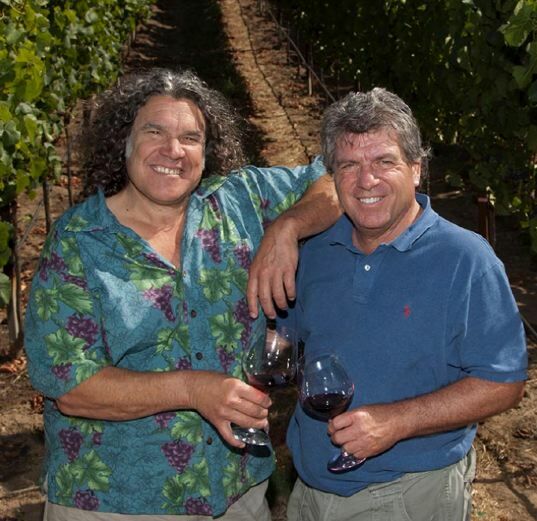 This winery is a partnership between brothers Roger and Richard Roessler. Phil Staehle, owner of Enkidu Winery, has been producing Roger Roessler wines for the past few years, but the winemaker since 2016 has been Drew Huffine. The winery’s focus is on Pinot Noir from Sonoma Coast vineyards. The Roger Roessler Wine Company brands include Black Pine, Roessler Cellars, R2 Wine Company and Roger Roessler Wines. For more information, visit www.rogerroesslerwines.com. 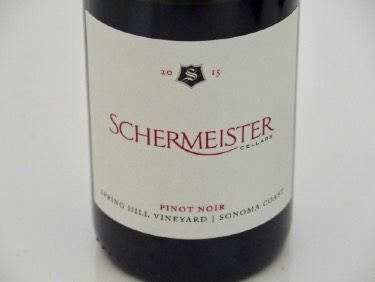 Proprietor and winemaker Robert Schermeister developed his skills as an assistant to noted winemakers Mark Aubert and Jayson Pahlmeyer. He crafts limited production wines from Napa Valley and Sonoma County. A tasting room is located in Jack London Village in Glen Ellen. Visit www.schermeister.com or www.princeofpinot.com/article/2441/. Winemaker Mike Sinor worked for six small wineries in the 1990s to help pay for his schooling at Cal Poly SLO. While working for Robert Mondavi at Byron Winery in 1996, Mike and Cheri LaVallee Sinor got married in Burgundy, France. Soon after, they started Sinor-LaVallee. Mike subsequently helped launch Ancient Peaks Winery and remains on the team as Director of Winemaking. Mike and Cheri purchased the Bassi Vineyard in 2013. That same year, Mike decided to turn the Sinor- LaVallee brand into an all estate program. 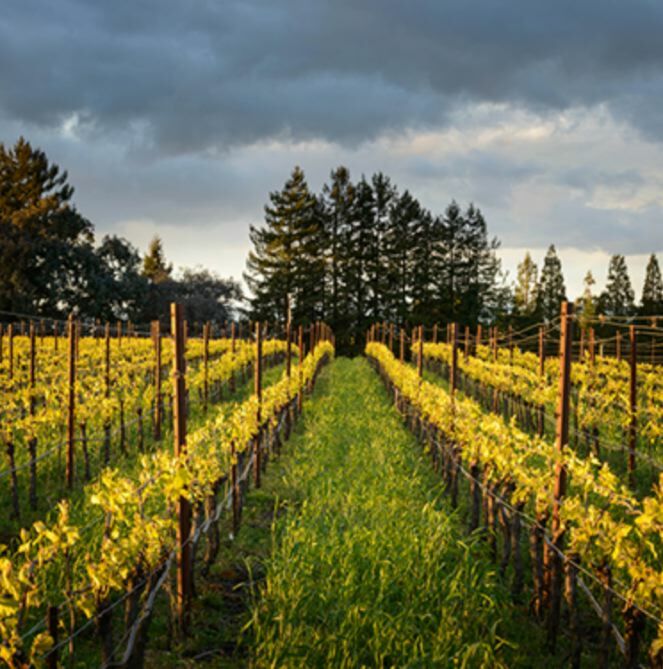 The vineyard, originally planted in 2001, is located alongside Highway 101 just 1.2 miles inland from Shell Beach. Half of the 30 acres are planted to 8 clones of Pinot Noir, and the remainder is split among Syrah, Chardonnay, Pinot Gris and Albarino. The vineyard is farmed organically with biodynamic input. Beginning in 2015, all grapes from Bassi Vineyard go into the 2,000 case production of Sinor-LaVallee. 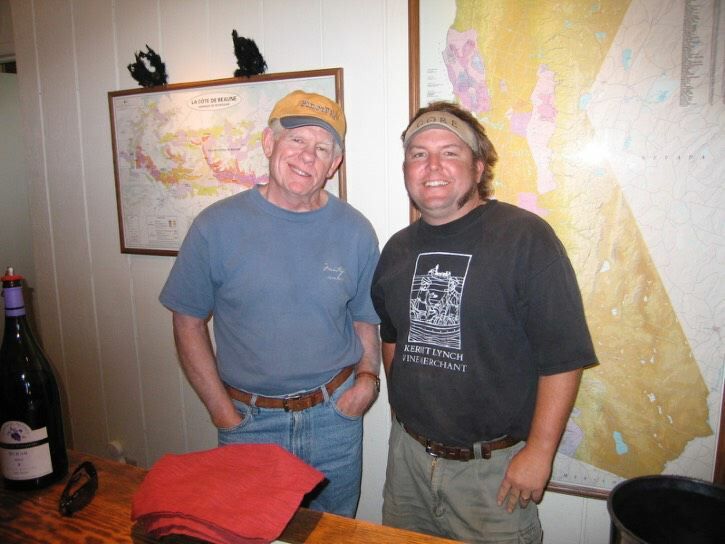 Mike was San Luis Obispo County’s Winemaker of the Year in 2012. A tasting room opened in early 2015 in Avila Beach (open Friday-Sunday afternoons). I first met Mike when he was the winemaker for Domaine Alfred (now Chamisal). The photo reflects our more youthful days. I followed Sinor-Lavallee beginning with the 2004 vintage and continuing until the 2014 vintage. With these wines reviewed here, I became re-connected with Mike’s production. 10.5% alc., 263 cases, $26. The front label shows an original oil painting done by Teddi Fuller of a bison skull that Mike’s late father shot and hangs at the winery. Fourth vintage for this “Pet Nat” sparkling wine created by “Methode Ancestrale.” Harvest Brix 17.8º. !00% clone 2A. Whole cluster pressed day of harvest. No SO2 or commercial yeast added. Pied de Cuve technique used to start fermentation. Tank fermented at about 55º F. Bottled 26 days after harvest. No SO2 or sugar added at bottling. Not disgorged. · Wine is under high pressure and bottle cap must be removed slowly as abundant bubbles emerge. White gold color in the glass. Very fragrant with aromas of apricot, nectarine, apple and botanical notes. Bubbles dissipate quickly. Quite enjoyable on the palate, with flavors of pineapple, lemon and white peach. A bone dry wine that has a little Muscat, Pinot Gris and Pinot Noir Blanc character. Not scored as I have never had a comparable wine, but I recommended it. Owner and winemaker Kristie Tacey specializes in Pinot Noir from the Santa Cruz Mountains, Russian River Valley and Anderson Valley. 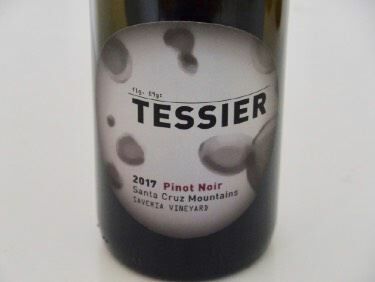 She launched Tessier Winery in 2009 and I have reviewed her excellent wines since that time. Visit www.tessierwinery.com or www.princeofpinot.com/winery/1538/. 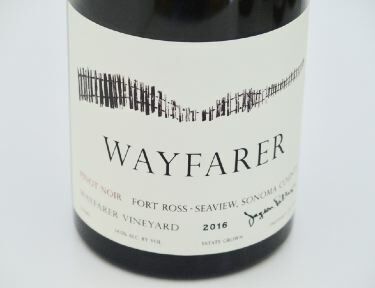 Wayfarer Vineyard is located in the Fort Ross-Seaview AVA. The vineyard is divided in twenty blocks and planted to multiple clones of Pinot Noir including 115, 667, 777, Pommard 4, Pommard 5, Swan, Mt Eden and Hirsch. I have been out to the vineyard with the winemaker Bibiana Gonzalez Rave who is also the winemaker for Cattleya and Pahlmeyer. It is an arduous but beautiful drive that takes about an hour from Sebastopol. Recently, just for fun, I joined a winemaker in tasting. 8 California Pinot Noirs from the 2016 and 2017 vintages that I had rated 94 or better. The wines were Brooks Note Weir Vineyard, Loring Rosella’s Vineyard, En Garde Pleasant Hill Vineyard, Benovia Tilton Hill Vineyard, Foursight Charles Vineyard Paraboll, Fulcrum Gap’s Crown Vineyard and ROAR Garys’ Vineyard.The 2016 Wayfarer Vineyard Pinot Noir was the favorite among all of these wines for both myself and the winemaker. This wine is a blend of grapes from the entire vineyard. Visit www.wayfarervineyard.com or www.princeofpinot.com/winery/2394/. The outstanding Wayfarer Chardonnay is reviewed later in this issue.